It perfectly covers even the furthest hidden corners of Prague almost non-stop. ‘Non-stop’ means that in they have the ‘noční doprava’ (night transport) service, so buses and trams also run during all night. 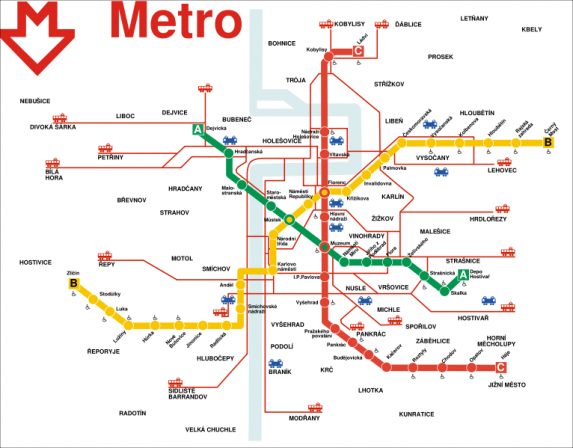 The night transport system works in intervals of 15 minutes (around the centre) and 30 minutes or more (out in the suburbs of Prague). Many of my foreign friends were not aware that every tram and bus stop has its own time table so everyone knows when to expect their ride. Even more impressive is that the trams and buses usually arrive right on time according to the time table and if you just miss your ride there is a new bus or tram arriving every 4-8 min. If you are interested you can print time tables for any bus or tram service that you are interested in on http://www.dpp.cz/en/. Stick it on your fridge, and you will no longer spend unnecessary time at stops. I personally find the Internet interactive timetable more useful, where all you have to do is enter the stop you want to get to and the computer gives you all the best connections with time and transit points if needed. The only problem is when you don’t know the name of the stop that you need to get to…. although you can always visit www.mapy.cz and type the closest street to the destination where you want to go. By scrolling from one side to another, you will be able to find the stop you are going to, just click on the stop icon and the name will come up. At peak hour (that is from 7 am – 9 am and 4 pm – 6 pm) the public transportation is the quickest way to travel. As in any other big city, the number of cars in Prague has increased 3x in the past 4 years and to get anywhere in peak is becoming a nightmare. For 3 years now I have been traveling with a pram, and for the last 18 months with the double pram. I have to say that I have had only good experineces with people helping me up onto the tram. Usually I didnt even have to say a word and somebody would offer to help. If you are unsure how to ask, just smile nicely and try a simple “Muzete mi pomoc ?” (Can you help me?) and someone will help you for sure. At the same time you will have to get ready to wave at the driver when they pull up at the stop, that way they know to watch out for you and check that you and the kids are all on board. Keep in mind to look out for the Pram stickers on each bus and tram, this indicates where you should enter and where you will find the extra allocated space for prams. Each tram is different, the older trams have the area in the back reserved for prams, the newer trams have the pram area in the middle of the tram. When exiting a tram make sure you press the assist button labeled: “znamení pro ridice” twice. This alerts the driver to the fact that you are getting off, they will then watch you at the stop to make sure you and the kids get off fine. Not every METRO station has a lift and the general practice is to hold onto your pram securely on the escalators to go either up or down. Yes, a bit barbarian and my sister who is a Canadian resident refused to do so with her child. For me it’s a practical solution to the problem of how to get up or down that doesnt do any harm. Just make sure your baby is strapped in! Children up to 6 years and prams do not pay, so no worries about the ticket. What I find extreemly helpful is the latest novity. If you send SMS to the number 9020626 text: dpt and you will receive an electronical ticket to your phone. They send only the one for 26 CZK. An SMS ticket provides transfer options and is valid for 90 minutes. Within approximately two minutes, an SMS ticket will arrive. This time is only an estimate. A duplicate of an SMS ticket can be obtained in the event that it was erased during its term of validity, for a fee of CZK 6. I very often take advantage of this option. I have never tried to send it from foreign number, however, I dont see why it should be a problem. Just add the country code to the number: +420 9020626. The yellow ticket vending machines are installed at all metro stations and at surface transport stops and are designed for the purchase of single tickets. It is my sister on pictures below with her single pram and my double pram right next to it. On the Tram !!! TICKET PRICES: 18 CZK basic ticket which does not allow you to transfer, you can use this ticket for 20 minutes on the bus or tram and travel 5 stops on the metro. The 26 CZK ticket allows you 90 minutes traveling and you can transfer as many times as you like.